‘The pillars “have hieroglyphic inscriptions giving the princess’s name and her titles, which include “the daughter of the king Men Salbo and his lover venerated before God the all-powerful,” [sic: in the Czech reports this auto-translates as “daughter of the King of his own blood, his friend, respectful to the power of God,” in the Spanish reports as “the king’s daughter, his beloved, the blessed before the great God” AKE].’ ” – via The EEF. 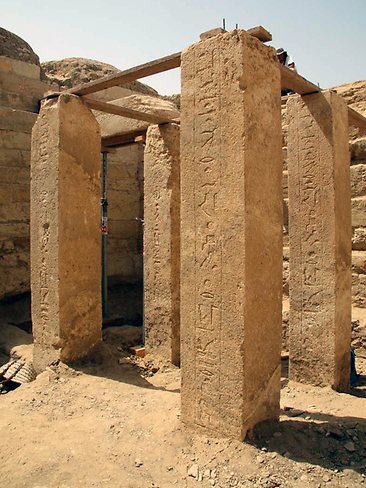 A higher resolution of the pillars with the hieroglyphic inscriptions (Source: The Australian). A higher resolution version of the photograph of the pillars is now available (see above), so those of us fortunate enough to be able to read hieroglyphs can see that there is no cartouche. “The king’s daughter of his body, his beloved, honoured by the great god, Sheret-Nebty” – ‘of his body’ was lost in translation and became ‘Men Salbo’. You see more photographs relating to the tomb here.